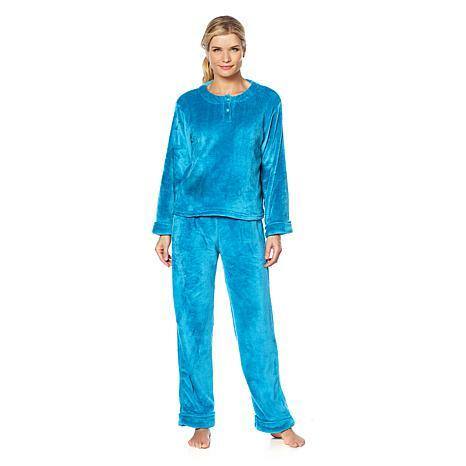 At the end of a long, hard day, you'll love to cuddle up in this super-plush pajama set. The effortless, loungewear design in a loose-fitting silhouette is just what you need to unwind ... and a cold glass of wine of course. Not since you were a kid have you bundled up in something this fabulously fluffy. I own 3 sets of these pjs. They are warm, fit great and the softest material ever! I highly recommend. As, a huge Soft and Cozy fan. I personally purchased this set in purple. I love the Henley Top Set and deep rich color. They wash great but, prefer to hang dry. They run true to size with a longer length as, I am 5'6 and they are a little long but, have many sets personally and make great gifts. I could never sleep in these, but wear the top on super cold days. Ill have to cut the pants down to wear them...huge! I am a small/medium, and probably ordered them too large...M/L. 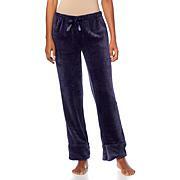 These are the softest pj's i have ever worn and beautiful too......i can live my life as a Queen in these.